This is optional and intended for special use cases - and if not specified files will be stored in users 'user profile'. To specify the path where SQLyog writable files are stored. 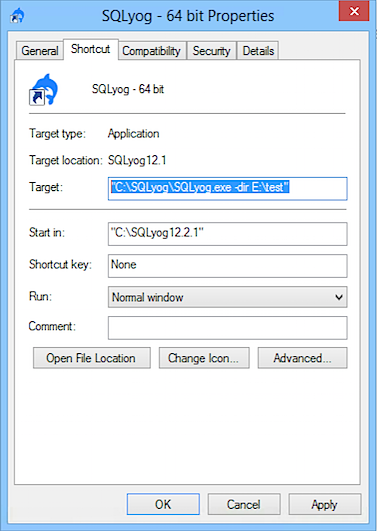 If you don't want to use command syntax but start SQLyog from a program icon then after normal installation (using the installer) you may copy and right-click a program icon/shortcut (on desktop or in start menu) and edit the command from the 'properties' menu. The -dir switch can also be used if you want to save all SQLyog-related files to an encrypted driver or folder - or if you for any reason want another file position than the default.